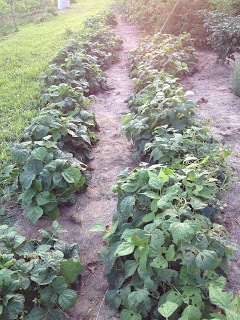 Even though this summer has been pretty dry again, my garden is going crazy! 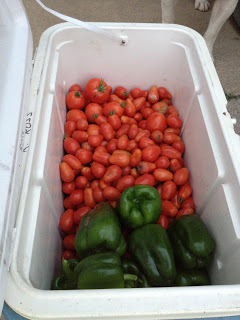 I’ve been canning or prepping vegetables to be canned pretty much every waking moment that I’m at home. I’m just about all canned out, but I’m only on my first round of green beans. I, for some strange reason, didn’t think that one packet would be enough, so I planted another whole packet. UGH! What was I thinking!?!?! I’ve already canned 30 quarts and 30 pints of plain green beans and I’ve also pickled 15 more pints. That should be enough to last us a long time and we still have some from 2012 on top of that! I’m running out of room real fast to store all my canned goods! 🙂 But that’s just less that I have to buy at the grocery store, not I’m not complaining too much. Just exhausted! 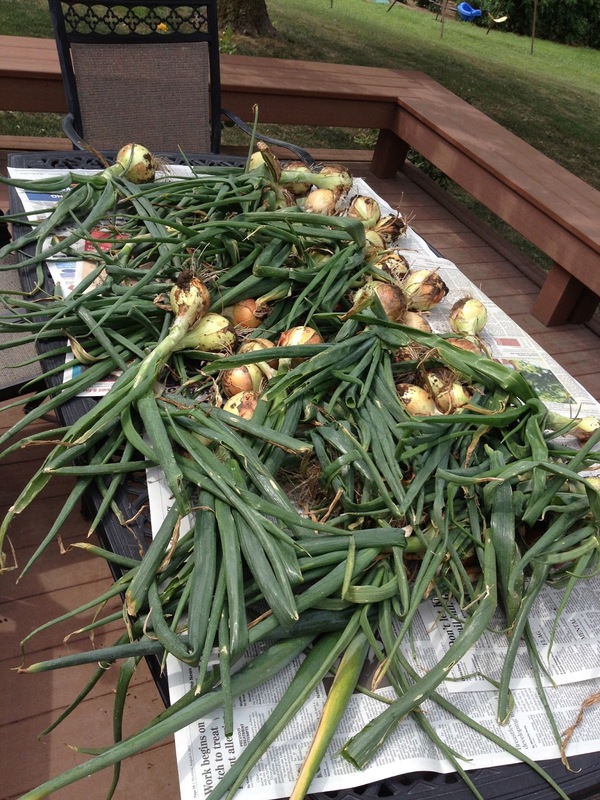 My onion crop did really well this year too. I pulled them all up a few weeks ago and laid them out on my table out back to dry for about two weeks. Most nights I can after the boys, or at least AJ, go to bed. Other than green beans, I’ve also been canning pickled zucchini (delicious! 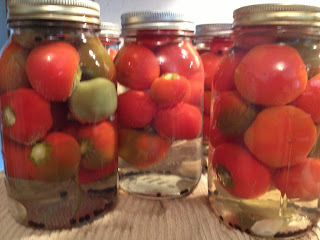 ), tomatoes, and pickled hot cherry peppers. For the pickled zucchini, I just substituted zucchini in place of cucumbers in a dill pickle recipe. I was worried that they would be mushy, but they were very similar to a dill pickle. I even did some spicy ones and everyone loves them…expect for HD. He likes the dill pickles from the store better. Oh, well, that leaves more for me! I will be doing a LOT more of this next summer! The tomatoes have been going crazy. There are so many of them, but they are small. 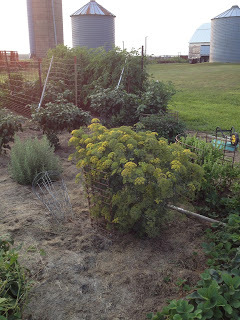 I planted all Romas this year, but they are about the size of large cherry tomatoes. This was my first year planting herbs, and the rosemary, dill and parsley did great. The basil got eaten by grasshoppers, the cilantro I pulled up early because it wasn’t doing very well and the oregano didn’t turn out well either. The bell peppers are growing like crazy! The one in the picture below that HD was holding was huge! 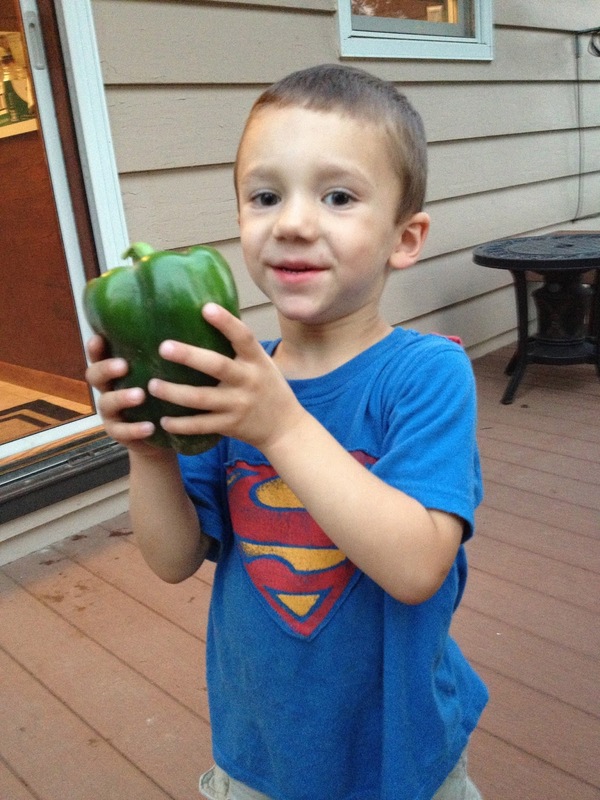 He loves bell peppers and couldn’t wait to eat it! I’m trying pickled hot cherry peppers this year for the first time. Hopefully the recipe that I looked up turns out good! My sister, Megan, has already requested a jar! So, that’s what I’ve been up to lately. Oh, yeah, and freezing 28 two cup bags of sweet corn and 26 dozen jalapeños. And there’s a lot more jalapeños growing right now! The only major disappointment this year in my garden are the pumpkins and gourds. They are all dying already and there are some nice pumpkins out there. I have a feeling that they are not going to last until Halloween! Bummer! Hopefully it will slow down for awhile and I’ll be able to blog more! Talk to you soon! « Another Iowa State Fair is in the Books! Good job Sara! I too have been doing a lot of canning. I’m going to have to try your dill zucchini recipe. Thanks!